My latest post at PopMatters is up. 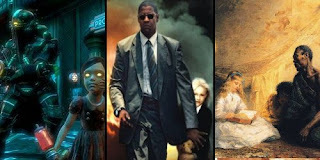 It’s about the black characters in last year’s excellent contributions to the Rapture saga: BioShock 2 and Minerva’s Den. The article examines the portrayals of Grace Holloway and Charles Porter and traces their connection to larger historical and cultural themes in U.S. society. It was a pleasure to write, as it required a combination of historical, artistic, and game design analysis. Though it may seem outrageous, many aspects of Rapture’s world are only slight embellishments on our own. Though it is disturbing, I highly recommend reading about Jonestown or listening to the final “audio log” from the doomed utopia. In my opinion, the piece’s argument is not very controversial: the explicit acknowledgement of Holloway and Porter’s race strengthens the game without turning the two characters into “token blacks.” Holloway and Porter possess distinct stories and personalities, but their experiences are also shaped by their society’s prejudices. Some of the essay’s underlying assumptions and implications might be more controversial: In a medium whose most celebrated characters are white, games that even have black characters, let alone important ones, are unfortunately rare. Artists should be free to create whatever they want; I do not strive, nor do I wish, to favor certain stories and suppress others. However, I do think it is important to realize that “blank slate” characters are rarely empty vessels. Every choice, whether it be a character’s gender, race, hair color, or stature both provide and eliminate certain creative possibilities. Had Holloway and Porter not been black, or if the game had ignored the concept of race entirely, BioShock 2’s cultural relevance would have suffered. Rapture would be a less nuanced place, and the game would have joined many others in turning a blind eye towards the impact of diversity or by implicitly endorsing a version of “normalcy” biased towards whiteness. Additionally, concepts such as colonialism, institutional racism, the Uncle Tom archetype, and the image of the noble protector/savage brute remain contentious. Such topics can often be uncomfortable to address, but I use them here not to establish guilt or place blame; they are integral in demonstrating how race and racism manifests itself in cultural artifacts. In Rapture, as in our society, race matters. BioShock 2 and Minerva’s Den acknowledge this. Because of this, the games must be examined in the context of other historical and artistic works that explore black people’s experiences and their representations in popular culture.